What makes some communes work, while others fail? Why is it so difficult to put utopian ideals into practice? 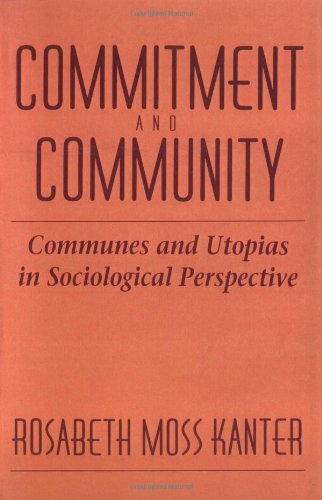 Rosabeth Kanter offers a unique analysis of the nature and process of enduring commitment, basing her theory of commitment mechanisms on exhaustive research of nineteenth-century utopias, sharpened by first-hand knowledge of a variety of contemporary groups. The book moves in a lively fashion from Oneida, Brook Farm, and the Shakers to present-day phenomena such as rural communes and Synanon. Rosabeth Moss Kanter (born 1943) is a tenured professor in business at Harvard Business School, where she holds the Ernest L. Arbuckle Professorship. In the 2007-2008 Academic school year, she taught a course to MBA students entitled Managing Change. A 1967 Ph.D graduate of the University of Michigan, she has written numerous books on business management techniques, particularly change management. She also has a regular column in the Miami Herald. She was #11 in a 2000s survey of Top 50 Business Intellectuals by citation in several sources.